An eggless, paleo, Whole30 breakfast with just a handful of ingredients! 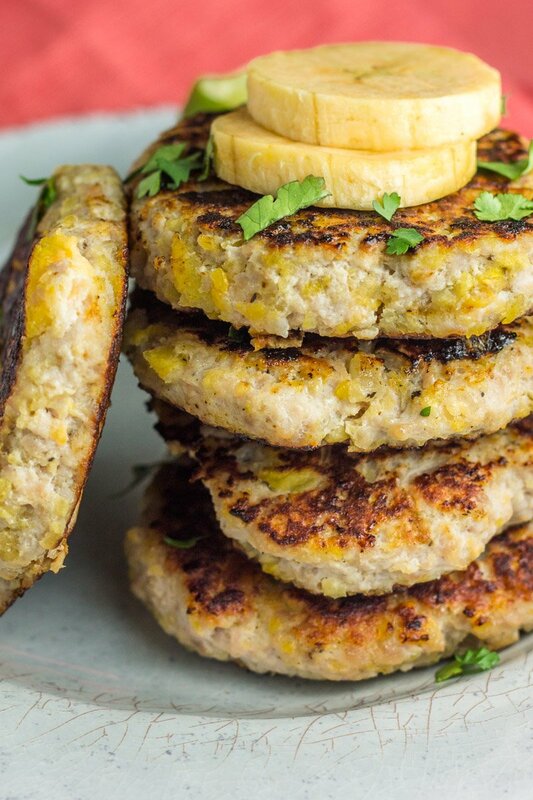 These 4 ingredient turkey plantain breakfast sausages are a quick and simple way to pack a punch lean protein to the start of the day. I empathize with my eggless friends, I don’t always understand them, but I try. Eggs are my besties. We go together like Jack and Rebecca, like yoga pants and messy buns, like mommying and wine. So when I made these 4 ingredient turkey plantain breakfast sausages and started eating ’em more often than scarfing eggs per my usual morning routine, I felt kind of like a traitor. Like Miguel (ok in fairness, we don’t know if he’s a trader…yet). Like jeans (who even wears those things anymore?). Like sipping on water after a day of epic tantrums. But if eggs had mouths and try these 4 ingredient turkey plantain breakfast sausages, pretty sure they’d be convinced too. Because although I love eggs, a really love plantains too. 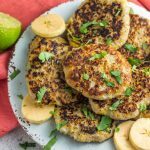 The combination of ripened plantains, a spritz of lime juice, and lean ground turkey is such a delight of flavors for breakfast (or lunch, or dinner if we’re being honest), it’s entirely possible you’ll slam three and still want more. Not that I’m talking from experience or anything…. 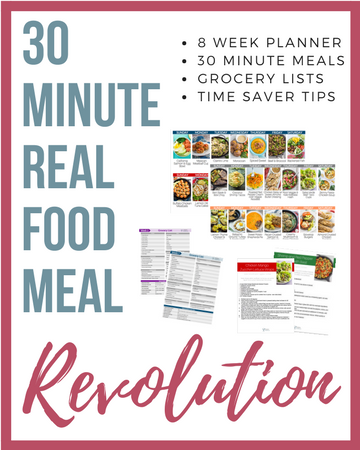 I pretty much love everything about this Whole30 compliant, eggless breakfast because they are as easy to make as one-click online shopping is after a rough day. They’re as simple as mindlessly watching The Real Housewives and realizing it’s already 11:30pm. They’re as tasty as triple chocolate cake (ok that might be a stretch, but I think you get the picture). And yes, these protein-packed breakfast sausages are only four ingredients. Let me rephrase, technically six ingredients, but who really counts salt and pepper as ingredients? That’s like saying coffee requires water and coffee grounds – I mean, duh. And yes, you can make a huge batch of these and keep in the refrigerator all week. Or better yet, freeze for later! Perfect for busy mornings and busy mommies. I love these just as much as I love my 4 ingredient pumpkin breakfast sausages (and I thought that couldn’t be done). Luckily, these plantain and turkey sausages are in season year round. 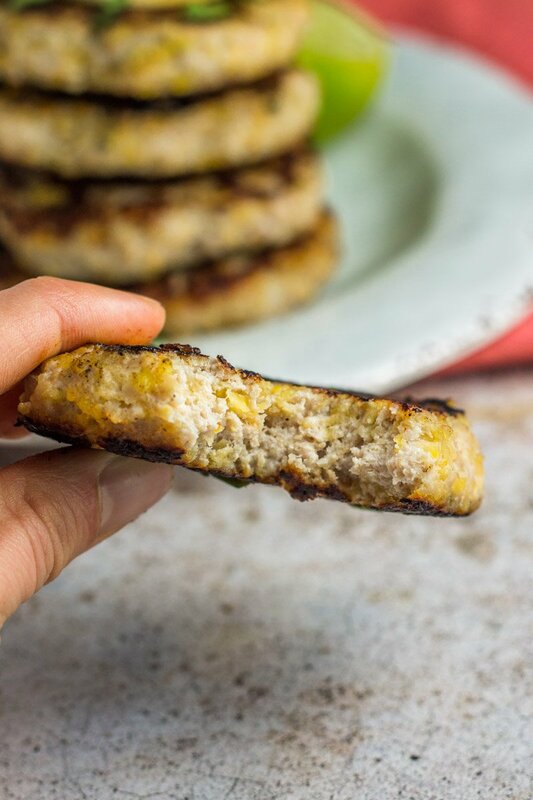 These no-fuss 4 ingredient turkey plantain breakfast sausages are the perfect way to power through your Whole30, plan your clean-eating breakfasts for the week, throw together for a quick and delicious lunch, or serve as a side WITH your morning eggs. The possibilities are endless. Eggless breakfasts your gig? 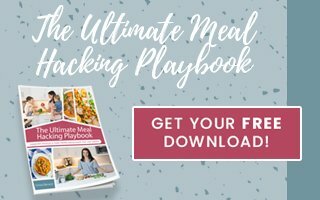 Then be sure to also try these Whole30 smoky sweet potato zucchini burgers, 4 ingredient pumpkin breakfast sausages, apple sweet potato brussels breakfast hash, healthy breakfast banana boats, and this balsamic ground turkey and apple hash, or check out this portable paleo breakfast ideas post for more inspiration! 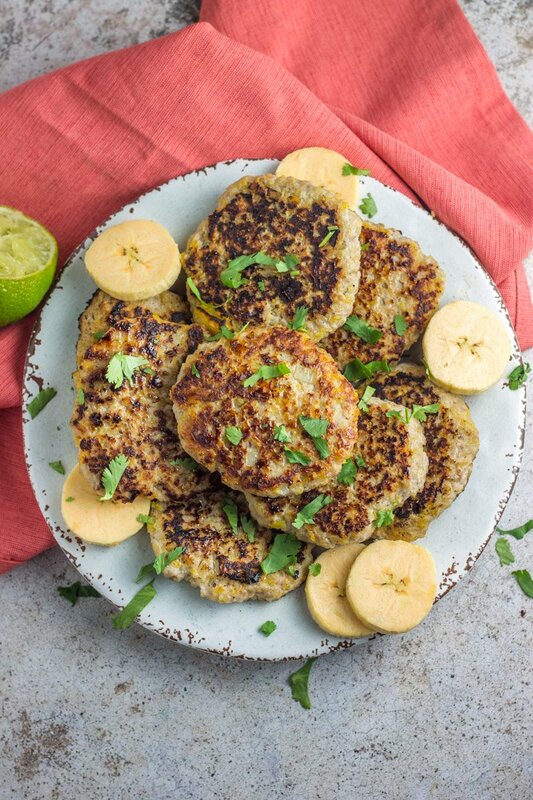 Place the plantain into a small food processor or mini chopper and pulse just a few times, until slightly creamy yet leaving a few small chunky pieces. Do not over process. Hmmm sounds like you might be better doing just ground turkey and spices or another turkey sausage recipe! Looks great! When you say scoop a 1/4 of the turkey mixture…do you mean a 1/4 cup? Makes 10 patties, right? What would you normally have with this as your Whole30 meal? Sorry just corrected this!!! 1/4 cup. I’ve had these with my morning eggs, or as a lunch with sautéed broccoli and compliant ranch. SO GOOD! Mmm…. I LOVE breakfast sausage, and I love that you made your own. It looks so good. Hi there! Would ground chicken substitute well in this recipe? My husband and I are devouring a plate of these right now, during our whole 30 re-intro. 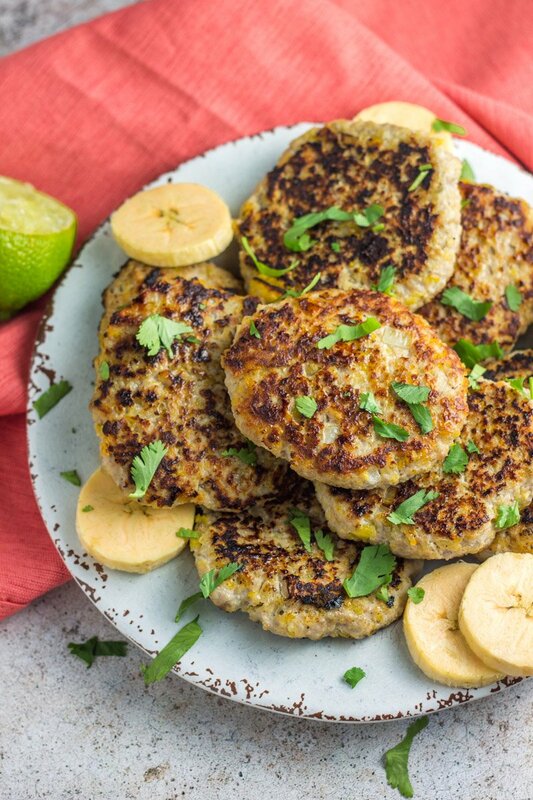 These are pretty much the perfect food for my Jewish Cuban husband who loves plantains and can’t eat pork 😂 I try not to keep anything with pork in the house which can be hard, especially when we get a craving for breakfast meat on a Whole 30, even Aidell’s chicken sausage is in a pork casing. Anyway, thank you! These are awesome. Do you think the turkey would freeze well or is it too lean? I’m so happy to hear that! I do think they would freeze well, although I haven’t tried it. Thanks Genevieve! Great, just made a batch. Delicious and have them packed for my breakfast at work tomorrow! Hard for me to answer that – I don’t count calories! Sorry! Depends on my morning – sometimes one plus a banana is sufficient for me, sometimes I’ll slam two if I have a busy day or workout later. These are delicious!! But what did I do wrong? I had like 2 turn out as patties, and the rest just fell apart. I’m guessing the plantain was pureed too much – more of a liquid cream than chunky?? I’m using for work lunches instead of breakfast, they came out so moist, was so excited. I love these for lunches too! Glad you like them Nelia! These are fantastic and I have probably made these a dozen times in the last couple of months! I’m SO glad you like them! Thanks! Hi there – are onions required for this? I try to stay low fodmap, so want to avoid them if possible. Also, can I use banana instead of plantain? Nope! You can omit the onions! Just gives them a little more flavor. However, I would not use a banana. I’m afraid they will turn out too sweet and mushy. Any tips on how this could be cooked in an oven instead? standing over the stove while I make these and having to flip them seems impossible when you’re 9 month only is trying to climb up the curtains lol they are so delicious though! !